A warm greeting from the Mitten! We have been in our new home for 3 months and things are going wonderfully. We actually really love our new area, even though we are in the heart of the suburbs. It may be big and traffic might be awful sometimes but I like to look on the bright side. There are a lot of very interesting places to visit and a lot people with similar interests here: Permaculture, holistic living, etc. With the help of Facebook and Meetup, I have joined some homeschooling/unschooling groups and Permaculture groups and have made friends quickly. Now that the craziness of moving, settling in, and the holiday season are just about over, I am really looking forward to increasing my knowledge base through reading. Thankfully, Michigan has a similar inter-library loan system to what Ohio has and I have requested a slew of books on Permaculture and related topics. I plan on sharing my thoughts on the books as I read through them. I also have been able to go to several in-person workshops (or skillshares) hosted by the various Permaculture groups that I participate in. In November, I attended two different workshops: a rocket stove workshop as well as a “making hard cider” demonstration. In December, I attended a meeting wherein three presenters presented their craft in short demonstrations: carving wooden spoons, making paper and wool felting. I was really intrigued with the wool felting. The presenter said that she doesn’t like knitting or sewing but really found that she likes wool felting. I am not enthusiastic about knitting or sewing either. I prefer other crafts such as soap-making, growing plants, and cooking. In November, a co-leader of my county’s Permaculture group put a call out to invite people to present a skillshare at future meetups. I offered to present on seed sprouting, soap-making, and baking artisan bread. She took me up on my offer. In a few weeks, I’ll be presenting on sprouting seeds for eating (not gardening) and then in March I will be presenting on cold process soap making. In preparation for my sprouting presentation, I am doing a lot of researching — revisiting what I already know but also expanding my knowledge base and my experience (by sprouting a larger variety of seeds). I am really, really glad that I am. I am learning so much. I have also improved my previous sprouting techniques. 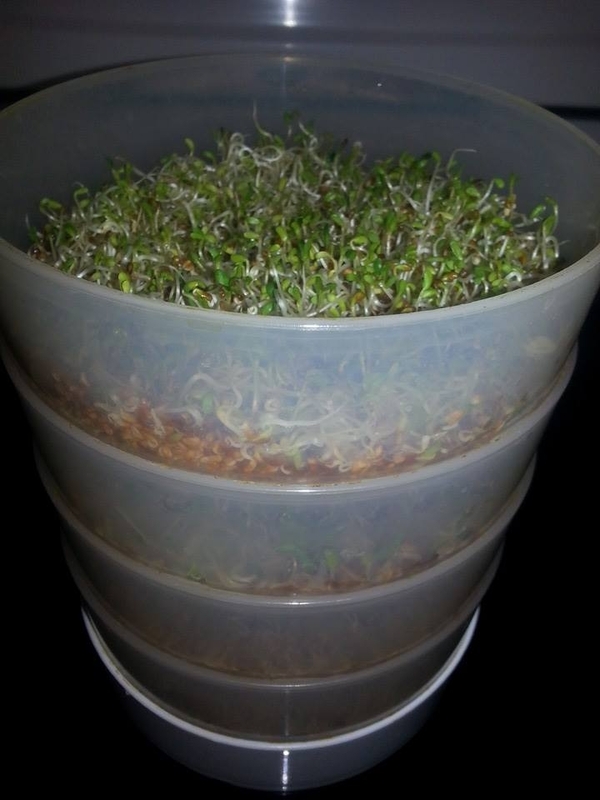 So, I plan on posting a series here on the blog about my adventures in sprouting seeds for eating. There is more to write but I will save that for later. Happy New Year to each of you!